Rebecca Winters, daughter of Gideon Burdick, a drummer boy in Washington’s army, was born in New York State in 1802. She was a pioneer in the Church of the Latter Day Saints, being baptized with her husband Hiram in June 1833. Membership in the Church brought persecution in Ohio, Illinois and Iowa. In June 1852, the family joined others of their faith in the great journey to Utah. It was a pleasant trip across Iowa through June, but in the Platte Valley the dread cholera struck. Rebecca saw many of her friends taken by the illness, and on August 15 she was another of its victims. She was buried on the prairie along the Oregon Trail near current day Scottsbluff, Scotts Bluff County, Nebraska. 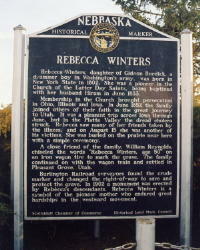 A close friend of the family, William Reynolds, chiseled the words “Rebecca Winters, age 50” on an iron wagon tire to mark the grave. The family continued on with the wagon train and settled in Pleasant Grove, Utah. Burlington Railroad surveyors found the crude marker in 1887 on the homestead of the Norman DeMott family and changed the right-of-way to save and protect the grave. In 1902 a monument was erected by Rebecca’s descendants. Rebecca Winters is a symbol of the pioneer mother who endured great hardships in the westward movement. In 1996, her grave was relocated a quarter of a mile east, to be near the State Historical marker, between Highway 26 and the railroad, 3 miles east of Scottsbluff. Note: In 2003 she was re-interned to a new site just a little way to the North but still beside the Union Pacific Railroad tracks. All Photos, Publications, and Information on this site are property of their respective owner. Website Design and Content © 2004 Rebecca Winters Genealogical Society. All Rights Reserved.